Are you looking for a way to add a GDPR agreement field to your site’s forms? By adding a GDPR form field to your WordPress forms, you can easily get consent from site visitors to collect and store their personal information. In this article, we’ll show you the easy way to get explicit consent from your site visitors to collect and store user data. This article contains general information. However, in all circumstances we strongly recommend you consult directly with legal counsel familiar with the GDPR regulations to review your specific use of WPForms. Why Use a GDPR Agreement Form Field? Come May 25, new regulations will be in place that include changes to data privacy and individual rights for people in the European Union (EU). And, since WPForms aims to be the easiest to use contact form plugin on the market to date, it should come as no surprise that we would help you comply with GDPR in a simple way. By giving you a GDPR agreement form field to add to your WordPress forms, you can begin complying with GDPR by getting site visitor consent when they fill out your forms. Not to mention, you’ll continue building your email list since people will know exactly what you plan to use their data for. So, let’s see how to add a GDPR agreement field to your site’s forms. The first thing you’ll need to do is install and activate the WPForms plugin. For more details, follow this step by step guide on how to install a plugin in WordPress. Next, you’ll need to create a new form. For help with this, check out our tutorial on creating a simple contact form in WordPress. The next thing you’ll want to do is enable WPForms’ built-in GDPR enhancements. 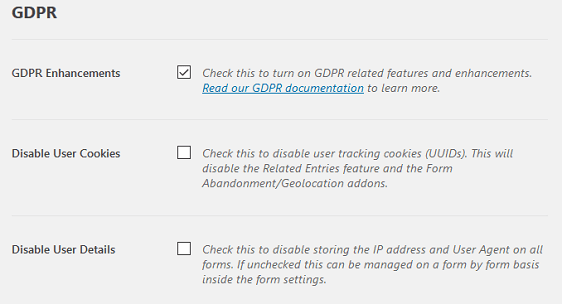 To do this, go to WPForms » Settings and click the ‘GDPR Enhancements’ checkbox. This will turn on specific GDPR features that you can use to help with GDPR compliance. Once you click this checkbox, you’ll be able to add a GDPR Agreement field to your site’s forms and customize it to meet your needs. Once you’ve created your form, it’s time to add a GDPR agreement form field. 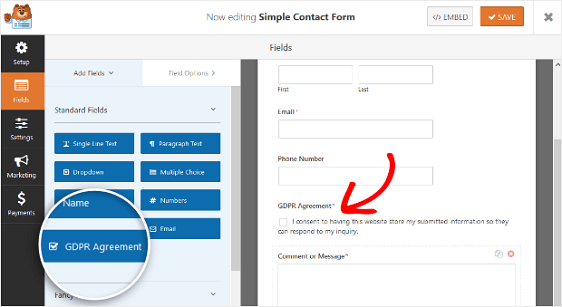 To do this, drag the GDPR Agreement form field from the left hand side of the Form Editor and add it to your form on the right hand side. The GDPR Agreement field comes with default wording designed tell your site visitors that by clicking on the checkbox they agree to have you collect and store their personal information. If you want, you can change this wording by clicking on the form field and editing both the Label and Agreement sections. You can also add more details in the Description section. If you have a lot of details you want to add to your form field, check out our step by step instructions on adding disclaimer or terms of service formatting to your checkboxes so your checkbox is more organized and user friendly. Or, if you prefer, you can link to a more detailed disclaimer or terms of service agreement. And there you have it! 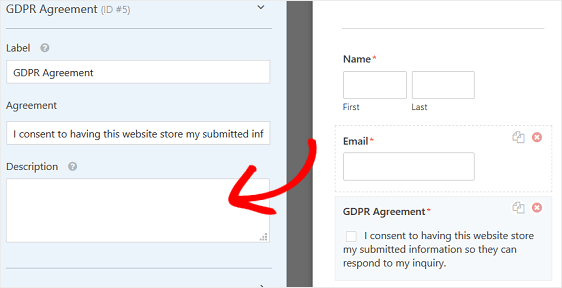 An easy way to add a GDPR agreement field to your site’s forms so site visitors can give explicit consent to have their personal information collected and stored. And, if you’re looking for a way to make sure site visitors know they’ve submitted a form on your WordPress site, be sure to read about how to send email confirmations so your users know you’ve been contacted. Is it possible to make this field not required? There’s no way to remove the requirement of the GDPR Agreement field. However, you can easily create a Checkboxes field with this exact same appearance — and then you’d be able to choose whether or not to require it. As an example of this alternative approach, you could check out our tutorial on adding a terms of service checkbox.